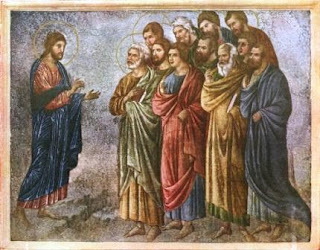 In Matthew 10, Jesus commissions the 12 Apostles to conduct missionary work among the "lost sheep of the House of Israel" (v6). He tells them to heal the sick, cleanse the lepers, raise the dead, and cast out devils (v8). The disciples of Christ were dispatched to preach the gospel in the towns and villages of Israel. "The Sending of the Twelve" by Duccio di Buoninsegna (14th century). Wolves existed in ancient Israel and are frequently mentioned in the scriptures. They are beasts of prey who hunt in the darkness of night. They are fierce, cunning, and have an appetite for other mammals. As such, wolves represent bloodthirstiness, ferocity, and treachery. Wolves were especially fond of stalking a sheepfold or goat pen at night in hopes of catching easy prey. Who are the wolves? Chief among them is satan. He is cunning and treacherous. He operates in darkness. He seeks to destroy the righteous. Other wolves include followers of satan such as false prophets, hypocritical leaders, oppressive tyrants, deceivers, and those that persecute the righteous. Sheep were also common in ancient Israel as a source of milk, meat, and fabric. However, unlike the wolf, sheep are weak, unassuming, and docile. They are not carnivorous. Sheep cannot defend themselves from an attacking wolf; death would be the certain outcome. The difficult message put into this analogy is that the disciples of Christ were to be sent forth into situations of certain danger and risk of death in which they were practically defenseless against powerful and vicious foes. They would be opposed, their mission would not be easy. Indeed, many of Christ's disciples perished at hands of ferocious wolves. Therefore, in addition to being the keeper of the sheepfold and their protector, Christ taught his disciples that they must act in a certain manner in order to survive the dangers ahead...to be “wise as serpents, and harmless as doves.” It was a fine line to walk, only possible through reliance on the Holy Ghost as one's guide.